I was contemplating a tremendous pile of fresh cucumbers from my garden today when I noticed a free local food magazine sitting beside them (called MIX). 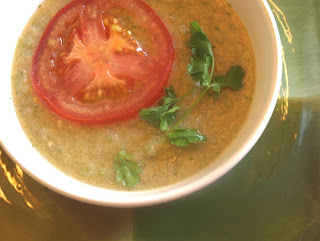 As it turned out, that magazine had a recipe for cucumber gazpacho that I immediately modified and made for lunch. It was delicious! Peel and chop the cucumbers and put them in a food processor or large blender. Chop and add the tomato, the 1/4 onion, and the garlic. Add the remaining ingredients and blend until creamy. Taste and adjust the seasonings. Refrigerate for at least 1/2 an hour before serving to allow it to chill and for the flavors to blend.